Starwood Hotels and Resorts is held in high regard among savvy business and leisure travelers. So when the company opened Starlab, a 46,000-square-foot brand-innovation studio in New York, the hotelier took special care to ensure every detail lived up to its reputation. Most interestingly, perhaps, is the way its conference rooms were designed. 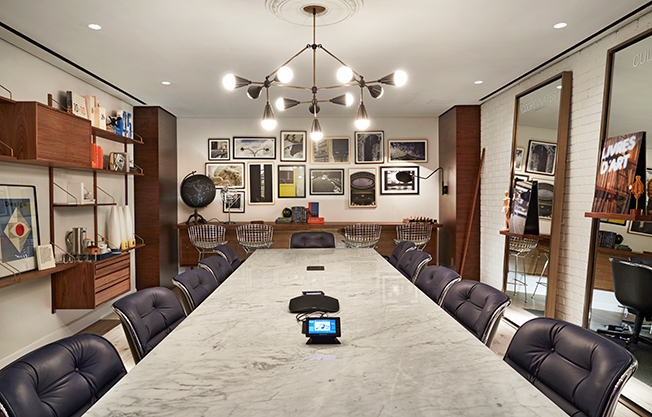 "Starlab looked to reinvent the traditional, staid conference room with four hotel designer suites representing [Starwood's] Luxury Collection, St. Regis, W and Le Méridien brands," said global brand and innovation svp Mike Tiedy. During our tour, we found items in each of the four spaces to be thoughtfully curated. For example, explained Tiedy, "the Le Méridien suite was designed to reflect the brand's refined aesthetic, influenced by midcentury modern design, which pays homage to the halcyon days of Air France, the brand's founder, and its development of the Concorde." This curio cabinet in the Luxury Collection Suite displays a cache of travel memorabilia, including vintage compasses, cameras, stamps and currency from around the world. The evening ritual at every St. Regis location has a bottle of champagne uncorked with a saber. A replica of an Air France Concorde, a nod to the airline that created the Le Méridien brand. These distinctive wooden dolls in the Le Méridien Suite were created by midcentury modern designer Alexander Girard and reference Le Méridien’s aesthetic. The W Hotel Suite channels the chain’s famous cocktail culture.